Crispy, satisfying and easy to make ! 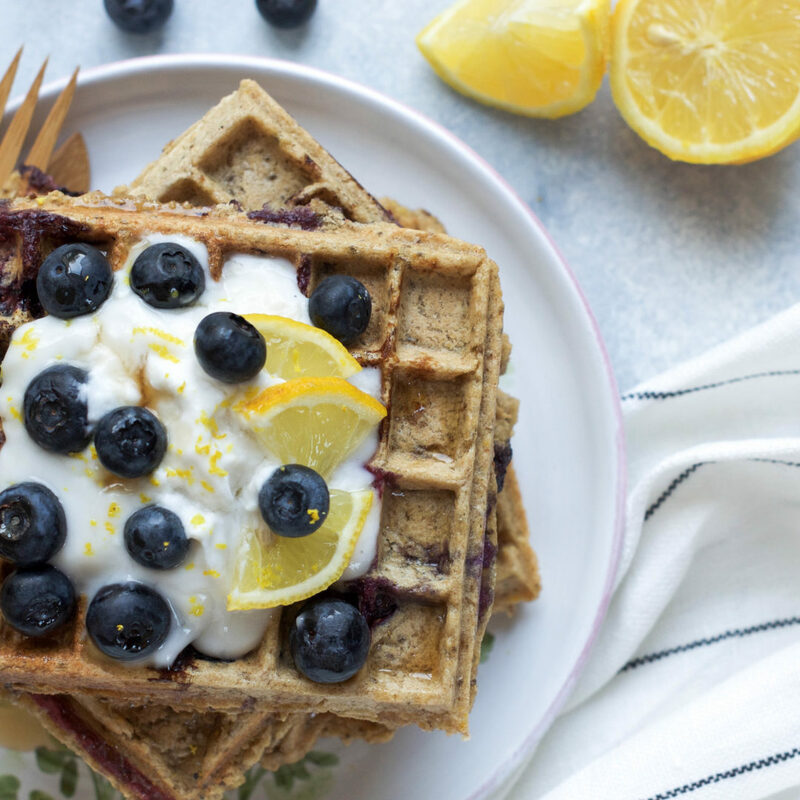 Give these Lemon Blueberry Waffles a try for a delicious week-end breakfast or brunch. Blueberries… I could go on and on about these little berries. They simply are my favorite fruit. Sweet and a bit sour at the same time, juicy, blueberries are also so good for you thanks to their high level of antioxydants. Tasty and healthy, that’s what I’m all about ! Depending on where you live, it’s true that blueberries can be expensive. I usually get them frozen since they are cheaper, but when the season is at its peak, I just can’t resist and end up splurging on these sweet jewels. But fear not ! This recipe only uses a handful of blueberries. It would be possible to use frozen blueberries for these waffles, but they would make greenish little swirls in the batter. These waffles might not end up looking the prettiest, but they would still be tasty for sure. All in all, I strongly recommend using fresh blueberries for these, if they are in season. You will not be disappointed, I promise. But otherwise, frozen are fine too ! Lemon and blueberries are a perfect match. 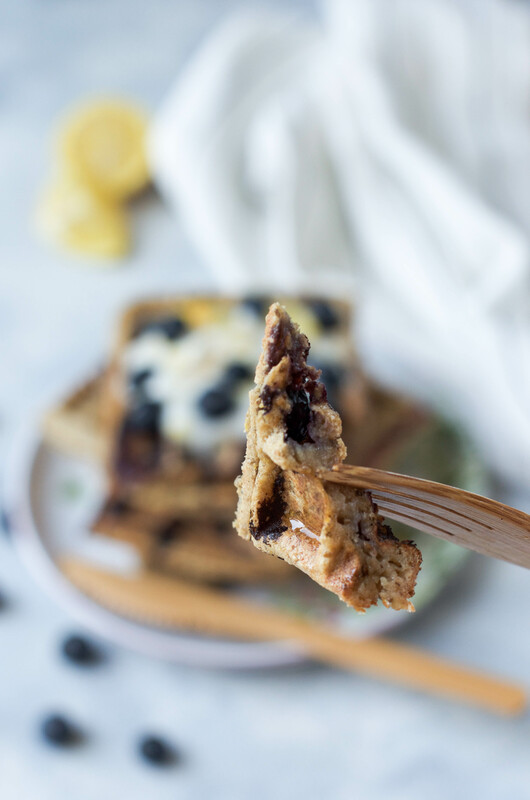 The sweetness of the blueberries and tartness of the lemon work so well together ! The lemon taste is still quite subtle in these Lemon Blueberry Waffles, as I didn’t want it to be overpowering. Feel free to add more lemon zest or top the waffles with lemon zest if you’re a fan of this little citrus. 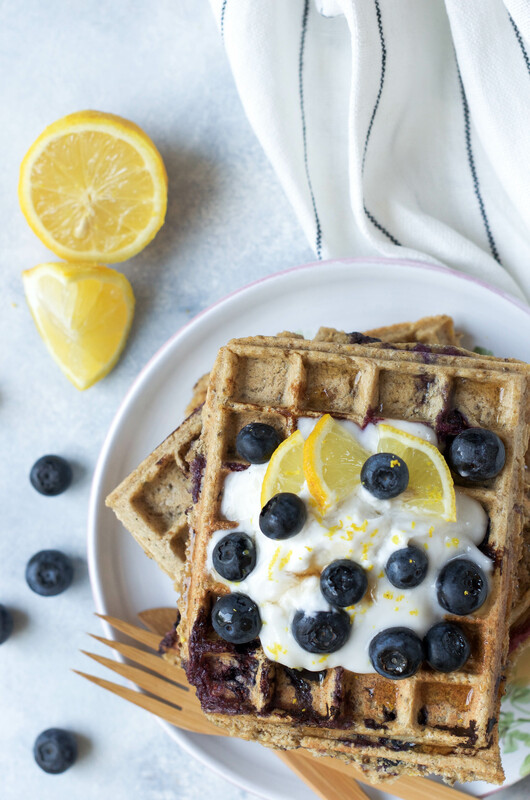 These Lemon Blueberry Waffles are very easy to make and will be ready in less than 30 minutes ! 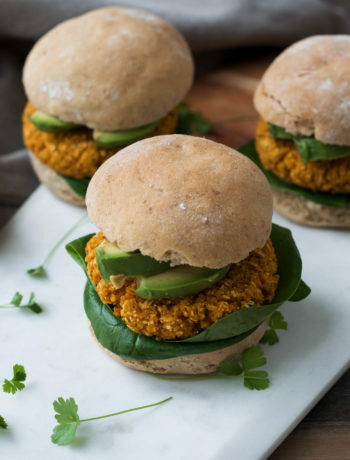 Perfect for a week-end breakfast or brunch. To make the batter, you need a simple base of ingredients : oat flour, almond milk, apple sauce, and a chia egg to bind it all together. Sweetened with some maple syrup, and full of flavors from the lemon and vanilla. To top it all off: beautiful blueberries that will burst in the batter while cooking. That’s your week-end breakfast sorted ! Keep your waffles warm in the oven while you finish making the batch. Cold waffles are definitely never as good as hot ones. If you have leftovers, you could store them in the fridge for the next day and just reheat them quickly in your toaster or oven. For toppings, I do recommend coconut yogurt and more fresh blueberries. That combo is amazing. You could also add a drizzle of maple syrup, sprinkle some seeds… Be creative ! Prepare the chia egg by combining 1 tablespoon of chia seeds with 3 tablespoons of water. Let the mixture thicken for 10 minutes. Blend the oats until they form a fine flour. 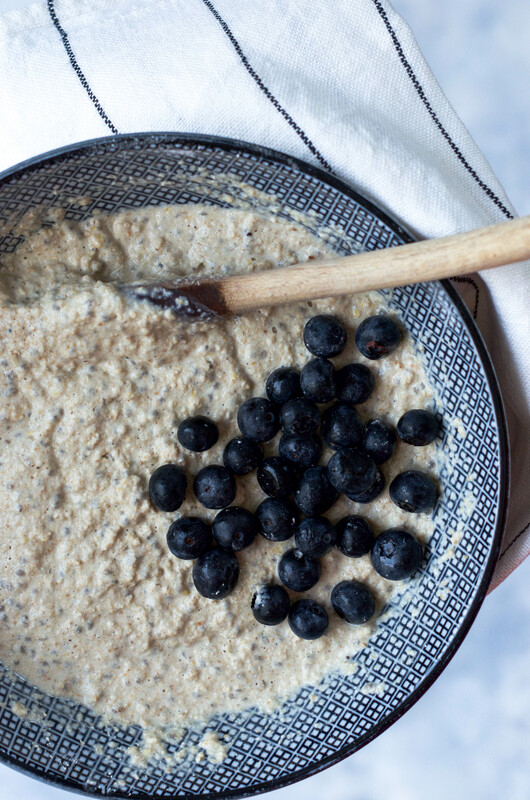 In a large bowl, stir together the oat flour and baking powder. In another bowl, combine the wet ingredients: chia egg, apple sauce, almond milk, vanilla extract, lemon zest, lemon juice, and maple syrup. Add the wet mixture to the dry, stir until just combined. ** Gently fold in the blueberries. Let the batter sit for 5 minutes. Lightly grease the waffle iron with coconut oil. When it is hot, pour the batter and spread it on the waffle iron using a spoon (it will be quite thick). Cook the waffles for 5 to 7 minutes, depending on your waffle iron. They should be golden brown. Serve warm with some coconut yogurt, blueberries, and lemon zest. You could also add a drizzle of maple syrup. Enjoy ! * Make sure your lemon is organic. ** Do not over mix, or you could end up with gummy waffles. It's okay if there are still a few lumps left. Looking for another breakfast idea ? You might like this Crunchy Cacao Coconut Granola !